Read more about the move—just a mile away, to Ellsworth Industrial Boulevard—and Quatrano’s career in our June issue, in the feature from our June issue. 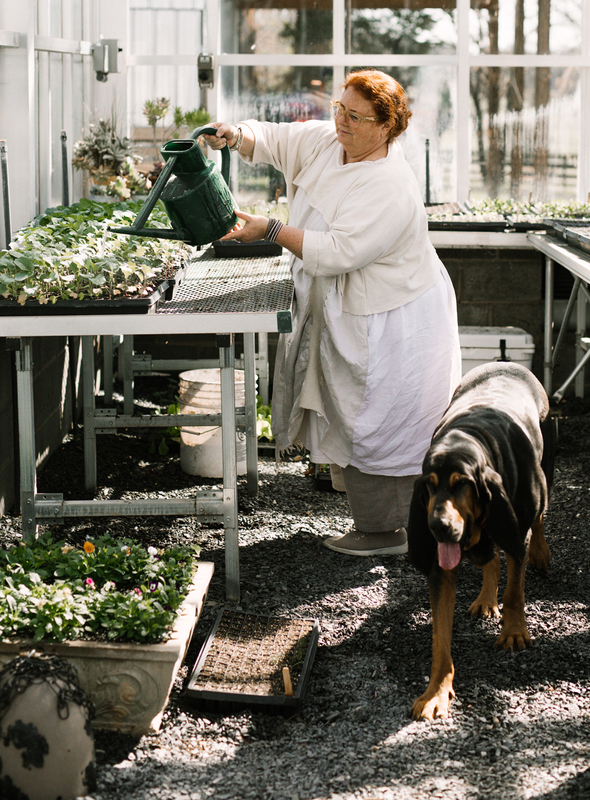 Below we’ve shared some outtakes from our interviews with the chef and restaurateur, who, while comfortable with change, remains as true to her seasonal, local credo as ever. I feel like it has always been my advantage to be a woman. I know that sounds crazy, but I started out cooking seriously in San Francisco in the eighties. The most influential chefs in San Francisco then—Alice Waters, Judy Rodgers, Joyce Goldstein—were women. Then, when I moved from there back to New York in 1986, I think other parts of the country wanted to emulate that, in a way. Clifford [Harrison, Quatrano’s husband] and I were hired often as a team, but if we weren’t, I’d ask, “Could my boyfriend work with us?” They were like, “Sure, but we’ll give you top billing.” That was always the case. It wasn’t because I asked for it; it was because they wanted women’s names. Then we got a job at the [now-closed] Grolier Club on East 32rd. They wanted a really fantastic restaurant and we gave it to them: We got two stars from the New York Times. And they always wanted my name first. Clifford really didn’t care; he just wanted to cook good food, and he is really into wine so he often helped with their wine program. The food was very feminine back then, too. It was nurturing, and there wasn’t food on the plate that wasn’t part of the plate. It wasn’t geometric in any way, it was kind of flowing and soft and very approachable. Even men were cooking that way. When food got very scientific, it definitely became more of a man’s world. Grant [Achatz] and Rick [Tramonto] at Trio in Chicago were at the beginning of that, right? I feel like they were really one of the first to get technical with food. The other thing that boys like to do is flex their meat muscles. It’s like the more processes that go into a piece of meat, the more attractive it is on the menu, or the more Instagrammable it is, and I just feel like that’s a little bit inappropriate. Our diners that come in and they want a perfect piece of lamb loin. They don’t care about the neck and they’re not interested in the belly. I think the younger the chef, the less secure they are and the less interested they are in pleasing guests. They’re more interested in experimenting. I really have to browbeat people sometimes to not use some kind of a seaweed or gelatin in their dishes. “Can’t you just make a perfect curd? Isn’t that enough?” A perfect curd is really hard! Adding gelatin is not hard. There is a lot of overthinking of food now, and I’m not that interested in that. The thing that we all need to understand—and I would say this about the people who write about food also—is that 99 percent of our guests are not in the food industry. They’re not food writers, they’re not chefs, and they’re probably not even exceptional cooks. They want food that is delicious and that they feel comfortable with. We have to understand we’re cooking to please those people. Chain restaurants like Houston’s—which I love—have a formula: You come in at an under 25 percent food cost, and your labor cost has to be under that, too. We run often a 35 percent food cost, and probably higher at Bacchanalia, because we don’t want to use anything but the best. And if the public only knew how much more chef owner-operators devoted to the food than other restaurants, I think that there would be no real choice of where to eat. Clifford and I have always believed that it is not the responsibility of Joe [Schafer, executive chef at Bacchanalia] to make sure that the restaurant’s finances were in order or to ensure the cost came in. That’s a little bit different from how a lot of restaurants run. I know plenty of chefs who their spend time, rather than encouraging their staff or creating delicious food, crunching numbers. That’s mine and Clifford’s job. But I like where we are. I’ve never been a wealth monger. Clifford would like more money, though. He’ll say, “Why couldn’t you be Ford Fry? Ford has got some big investors behind him. That could be us. Our life would be easier if that was us.” And I say, “It might be, but they have to answer to something much bigger than we do.” We use our own money because once you get investors involved, there’s a bottom line that you have to meet. I saw a great talk by chef Rene Redzepi recently, and he said, about what he charges at Noma [a two-Michelin-star restaurant in Copenhagen that has been called one of the best in the world]: “I know a lot of people will say 300 dollars is a lot. But honestly, it should be twice that for the people who grow and harvest the food to be paid what they deserve. If they all got paid to live a comfortable life, it would cost you 600 dollars to eat at my restaurant.” Nobody would pay 300 dollars in Atlanta, let alone 600. And Redzepi has had an extremely fortunate run at being the number one sought-after restaurant in the world that’s always filled. And he deserves it. He also said that if our job was just to give people what they wanted, we’d cook nothing but steak and brownies because that’s really what people want to eat. I don’t believe that’s all people want to eat. But I also don’t feel like it’s my job to make them eat bloated bugs that taste like sugar. In the beginning, my job here in Atlanta was to bring back our farm and other farms—to make Southern diners care about the people growing the food served at fine restaurants. And we’re also teaching the chefs who come through our doors the value of the product and respect for the people who produce it. We almost always are broke, but we believe in buying the best ingredients.